Paige Hadley looks for a way through the South African defence. 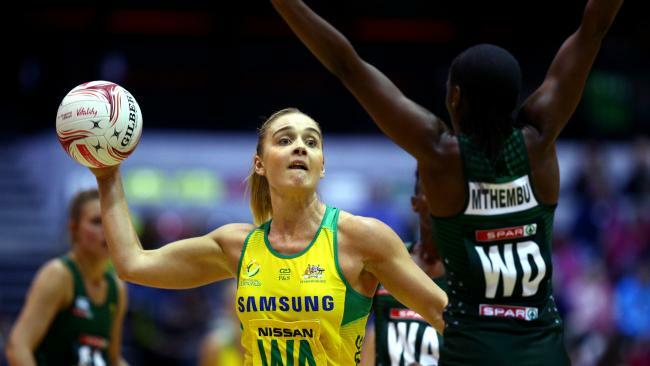 AUSTRALIA has escaped with one of their smallest victories against Commonwealth Games rivals South Africa to open the 2018 Quad netball series on a victorious note in London. Despite the narrow 54-50 win, Australia coach Lisa Alexander said she was pleased with the way her players controlled their destiny, coming home hard in the final quarter to take the four-goal victory. South Africa, coached by former Australia coach Norma Plummer, has been on the improve in recent times but the win in the 36th Test match-up between the two countries early Sunday morning (EDT) has kept Australia's perfect record against the side in the international arena intact. "We learned from that last quarter that when the going gets tough we can push out a win," said Diamonds defender Gabi Simpson. "It will give us confidence going forward that we can get ourselves out of potentially bad situations." Australia has been drawn in the same pool as Jamaica, South Africa, Barbados, Fiji and Northern Ireland at the Commonwealth Games in April. The other pool will be fought out between New Zealand, England, Malawi, Wales, Scotland and Uganda. In the other game in the Quad Series on Sunday morning, world No.2 New Zealand were beaten by England 64-57 in extra time. Aussie coach Alexander said South Africa, who Australia beat by 61 goals in 1999, have evolved into one of the most dangerous netball sides. "People need to understand that South Africa is no longer a team that you can beat by 20 goals," Alexander said. "That's very clear, they have improved enormously. "They are stronger and fitter, they have a great combination that's worked together for quite a while now and they are doing quite a good job as a team. "It's tough for us to come up against them, but at the end of the day we did what was needed, when needed. I was pleased." Also pleasing for Alexander was Australia shooting at a high 95 per cent accuracy for the game. "The shooting was fantastic throughout the game," Alexander said. "I was really pleased. The shooters played their role and put the ball through the ring. "Particularly Susan Pettitt who came on in the second half, she really controlled that end very well. She played very smart." Australia's next match is against England early Tuesday (EDT). Diamonds shooting statistics: Caitlin Thwaites 22/23 (96%), Gretel Tippett 8/9 (89%), Caitlin Bassett 13/14 (93%), Susan Pettitt 11/11 (100%). South Africa shooting statistics: Lenize Potgieter 34/38 (89%), Maryka Holtzhausen 16/18 (89%).